Later this week, the Bureau of Labor Statistics (BLS) of the U.S. Department of Labor will release a key report on the health of the U.S. labor market and economy, but it’s not the one you’re probably thinking of right now. The monthly Employment Situation Report from the BLS is the most closely watched economic report of the month, and the details are endlessly dissected by the media and market participants as they try to gauge the next step for the financial markets or the Federal Reserve (Fed). Indeed, we pay close attention to that report too, and we’ll be posting a blog on the report right here on Friday morning (so, guilty as charged). But it’s the “other” report on the health of the U.S. labor market and economy, the Productivity and Costs Report, that is the subject for today. That report is due out on Wednesday, May 4, 2016, and in recent years, it has at best been an afterthought for most in the financial markets. But that may be changing. Productivity (as measured by output per hour worked) is slowing, and there is an ongoing debate about productivity in academic circles that has occasionally crossed over into the mainstream—often when productivity is mentioned by a member of the Fed’s Federal Open Market Committee (FOMC). The debate is whether the slowdown in productivity is cyclical, structural, or something else—that something else being a “measurement problem” (more on that in a future blog). Productivity matters because it’s the building block for how fast the economy can grow. The maximum gross domestic product (GDP) growth rate (also known as potential GDP) is equal to productivity growth plus labor force growth. 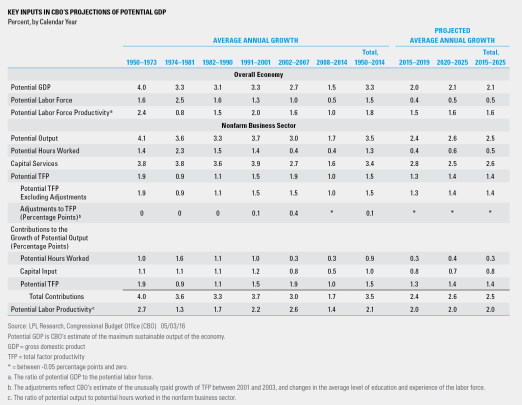 As seen in the table below, since the start of the Great Recession, productivity growth has slowed to around 1.0%, from a 1.5–2.0% pace seen in the 25 years prior to the onset of the Great Recession (1982–2007). Due to demographics, labor force growth is slowing as well, which puts the pace of potential GDP growth around 2.0% since the end of the Great Recession, 33% below the 3.0% pace seen in the 25 years. In recent quarters, potential GDP has slowed to around 1.5%. Because productivity growth plus labor force growth equals that maximum rate of growth for the economy, if the maximum (or potential) GDP growth rate is just 2.0%, an economy growing close to or just above 2% will strain resources and put upward pressure on wages and prices. So even though the economy has posted just a 2.1% annualized rate of GDP growth since the end of the Great Recession, the economy is taking up slack, and slowly, inexorably pushing wages and prices higher. At some point, the Fed (and the financial markets) will take notice. The monthly jobs report (known as the employment situation report) is a set of labor market indicators based on two separate surveys distributed in one monthly report by the U.S. Bureau of Labor Statistics (BLS). The report includes the unemployment rate, non-farm payroll employment, the average number of hours per week worked in the non-farm sector, and the average basic hourly rate for major industries.